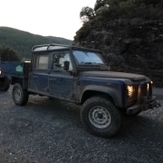 Land Rover's, music, women, drink and digging for fossil fuels! Make a wooden jig of the window, clamp on to the side of 90, use a plunge router to cut the aluminium, with a guide bush against the jig. Perfect windows everytime and nice neat cut. air leak on the manifolds? Land Rover related saloon as everyday car? I helped a chap put a 200tdi in a Rover P4. It was originally a 2.25 petrol, so we pulled the lump put the 200 in, and made up the exhaust. It was getting ridiculous MPG - 45mpg sounds about right. It went to Italy and back. He then sold it to a bloke who started welding it up, and I think he's sold it now as well. It was quick, it had a RRC diff in it IIRC, but it handled like an absolute pig. I would suggest the SD1 idea is a good one - they're bloody awful cars to look at though! I believe the Series disc has a larger inner OD and different bolt pattern. I had planned to bore the centre out and redrill it. You may well be able to use a different type of caliper from something cheap, the Series caliper is not the JCB item I think? 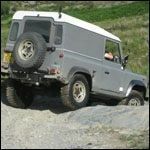 In my vast array of left over Land Rover rubbish, I happen to have a Defender X disc and the X-Eng bracket you bolt to the back of a Series transfer case to mount the caliper.... Might you be able to knock something up? As it's the time of year for generosity etc, (and knowing what it is like to be a student) you can have these pieces if you can arrange a relay? Powder coating to Zinc plate or not? If you use a proper marine epoxy powder coat it will be fine. my chassis was galv'd, then had a light coat of cold zinc and then had an epoxy powder coat. It got scratched around the radius arms but never chipped off in big chunks. that sounds interesting! I thought they could only tow 2ton, I'd imagine you were over that!